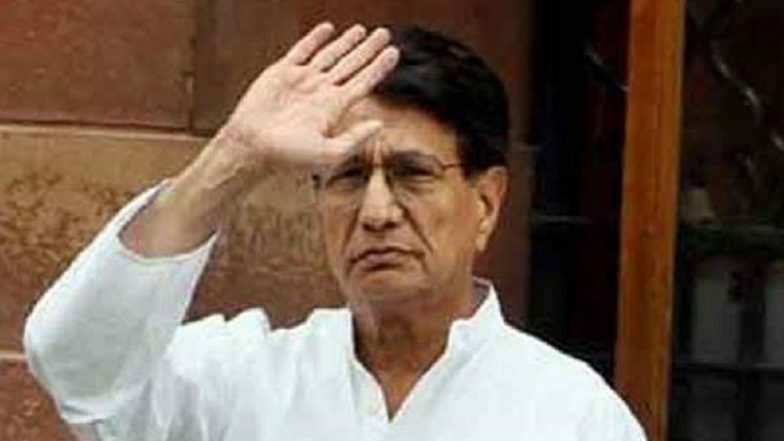 Muzaffarnagar, March 26: RLD chief Ajit Singh has declared movable and immovable assets worth Rs 16.61 crore in an affidavit filed along with his nomination papers for the Muzaffarnagar parliamentary constituency. Singh filed his papers as the the SP-BSP-RLD alliance candidate for the Muzaffarnagar Lok Sabha seat in western Uttar Pradesh on Monday. Polling in the constituency will be held on April 11. Singh, a former Union minister, is the richest among the 22 candidates from the constituency. He has declared moveable assets worth Rs 1,51,88,936 and immoveable properties worth Rs 15,09,36,666. He has no vehicle and no criminal case pending against him, according to the affidavit. Lok Sabha Elections 2019: RLD Leader Jayant Chaudhary Meets Akhilesh Yadav, to Join SP-BSP Alliance.